If you are looking for a fragrant easy care plant that is good for cut flowers, them Dianthus x allwoodii and its cultivars are well with considering. 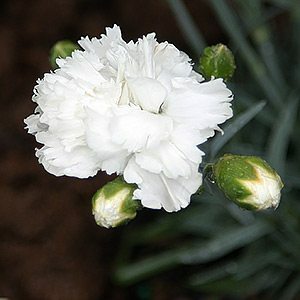 These are an evergreen ‘Border Carnation’. Low growing however with flowers on stems long enough for picking. The foliage is a grey green and forms a mounded dense clump over time. Some new cultivars worth mentioning are Dianthus x allwoodii ‘Memories’ which is a white flowering variety and Dianthus x allwoodii ‘Passion’ with its deep red flowers. So far we have fragrance, easy care and great cut flowers, add to this Dianthus x allwoodii makes a great ground cover plant and they also grow well in containers. Once established these are a very easy care plant. They prefer a position in full sun to part shade and a humus rich well drained soil is best. Before planting, dig the soil over well and them dig in some well rotted compost, some cow manure and some blood and bone. This is a naturally low growing compact plant. The only pruning that will be required is deadheading after flowering. Dianthus x allwoodii has very few problems, poorly drained soil is the biggest issue. In such situations, mound up the soil before planting to improve drainage. Heavy clay soils are not suitable. Mulch around the plants to maintain a cool moist root run. Apply some extra mulch and some blood and bone each spring around the base of the plant. Use a slow release type fertiliser in spring and the occasional watering with a seaweed fertiliser for great flowers. Use Dianthus x allwoodii as a border plant, grow it in containers or even in a window box. Plant will reach around 30 cm when in flower, so they are best placed near the front on the garden.